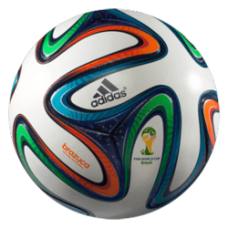 In the summer of 2014 players will play at the World Cup in Brazil balls Brazuca. The design of the new ball for a long time kept secret, but in an open vote, which was attended by more than a million Brazilians, his name has been defined. For option Brazuca voted 77.8% of respondents. For the first time in the history of ball fans chose the name for the World Cup. The design of the ball in the adidas described as revolutionary and six panels. Brazuca decorated with ribbons of three colors, symbolizing the so-called desire bracelets worn in Brazil. According to legend, the bracelet should be wrapped around the wrist and tie the knot three zagadyvaya desire for each of them. When the bracelet will tear himself fall from his hands, it is believed that making a wish should start to come true. In the language of the Zulu word Jabulani means "to celebrate". The ball is in the South African sty.. Designers like resurrected the famous balls Tango family of the 1980s: the ball is in Europe this ch..
Official World Cup 2018 ball in Russia. Modern design with pixel graphics was developed based on the..